WELCOME TO RESURRECTION LUTHERAN CHURCH! Sunday school starts the morning at 9:00 am with worship at 10:00 am. If you have been visiting and worshiping with us here at Resurrection and are interested in becoming a part of our faith community, please speak with the pastor. Coffee fellowship follows the service so please come and join us. WE CARE ABOUT YOU AND YOUR FAMILY! What’s important to you is important to us. Requests are handled with the utmost sincerity and respect. A Sunday morning prayer sheet is on the sign up counter. The Prayer and Care committee (prayerandcare@rxluth.com) meets each Wednesday morning for prayer at 9:00 AM. Bert can be reached at 522-6767 or at bert.kirkpatrick2013@gmail.com. Or call the church office at 522-1091: Let us pray with/for you. RLC T-SHIRTS FOR OUR 60TH ANNIVERSARY - We will be ordering new RLC t-shirts in honor of our 60th Church Anniversary. In preparation, we need to have an estimate of how many shirts to order for pricing discounts. If you have not yet spoken to Barry Schroeder, please contact him today! YMT PLANT SALE STARTS MAR 24th – Fellowship hall. Fundraiser for YMT. Please support. VETERAN PARTNERS ON A MISSION APRIL 4th – Pr. Dave Fulton is the chaplain of the Dole VA Center and is spearheading this program. His hope is to build a network where congregations can be mission outposts for Veterans helping them to find resources as they need them and a way to enable volunteers to join our VA team. If anyone is interested in attending a lunch to find out more about this new mission, let Pr. Elizabeth know by next week, Mar 31st. COMMUNION INSTRUCTION CLASS - If your child is ready to receive communion instruction, class will be on APRIL 13th from 10:00-Noon. We ask that an adult stay with their child to help them follow along. Please sign your child up to be sure we have enough materials for all. 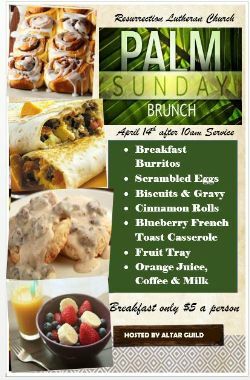 PALM SUNDAY BRUNCH April 14th – Altar Guild is hosting a wonderful brunch following the service. Suggested donations $5 per person or $20 per family. COMMUNITY PALM SUNDAY SERVICE APRIL 14th at 6 pm at Haysville Christian Church. 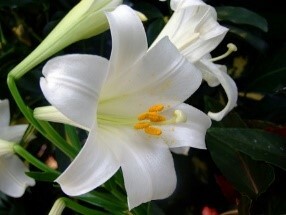 EASTER LILLIES – Altar Guild is taking orders for Easter Lillies in memory of loved ones. Only $10 and you can take home your plant after Easter Service on April 21st. Sign up is on the narthex bulletin shelf. Make sure to write in your memo $10 for lilies. Orders due by Apr 14th. EASTER VIGIL & HOLY WEEK - Sign up sheets to help with the services in the narthex on a table. Feel free to take a copy to practice. TOMAH SHINGA REGISTRATION OPEN! Camp Tomah Shinga is excited to see returning campers and welcomes new campers at each session. Programs are for youth of all ages. Register before April 1st, to receive $50 off the registration fee. Register at http://tomahshinga.com/summercamp. SANDWICH SATURDAY – APRIL 27th at 9:30 am. YMT GIRLS LOCK IN APRIL 27th - Girl’s Lock-In for middle and high school girls. It will begin Sat. April 27th at 5:00 p.m. and end with going to Sunday Worship on the 28th. Activities planned include a Bible Study and cookie baking for Sunday fellowship. FAMILY PROMISE VOLUNTEER TRAINING – MAY 4TH Here at the church. LOOKING AHEAD- MARK YOUR CALENDARS MAY 5th The committee is working on a celebration for our 60th Anniversary Celebration. Bishop Roger Gustafson will be preaching and a luncheon will follow the service. CONFIRMATION DINNERS–Thank you for providing a meal. It is very much appreciated! APRIL 14th 10:00 AM PALM SUNDAY WORSHIP SERVICE procession of palms and the reading together of the Passion according to St. Luke. PALM SUNDAY BRUNCH following service hosted by Altar Group. Cost is $5 a person for a fabulous array of food. APRIL 14th HAYSVILLE COMMUNITY PALM SUNDAY SERVICE join the Haysville Ministerial Association for a service of praise at 6:00 PM on Sunday evening at the Haysville Christian Church. APRIL 18th MAUNDY THURSDAY worship begins at 7:00 PM. On this “the night in which our Lord was betrayed” we begin the celebration of “Triduum” (the Three Days) with the Rite of Foot Washing and the Last Supper. APRIL 19th GOOD FRIDAY worship begins at 7:00 PM with a Tenebrae Service. We celebrate God’s victory in the cross as revealed through the Passion story. 7:00 AM Easter Vigil Service with Holy Communion begins our morning. 8:00 AM Coffee & Donuts in the fellowship Hall. 9:00 AM Youth Activities for Easter. 10:00 AM Easter Celebration Service with Holy Communion.